What is happening with diesel cars and environmental zones in Sweden? 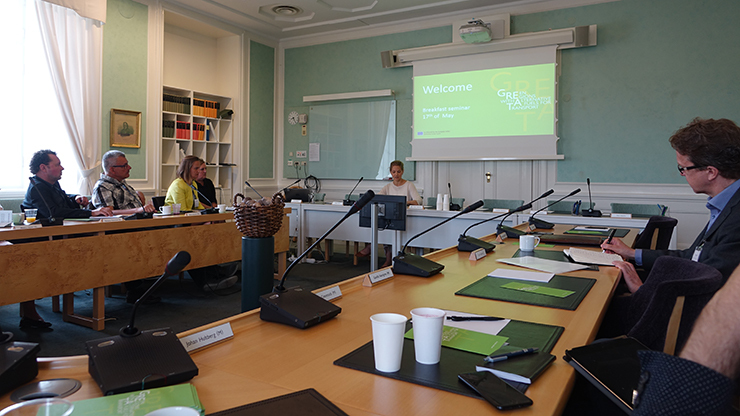 GREAT arranged a breakfast seminar on 17 May at the Swedish Riksdag (Swedish national parliament) hosted by Kristina Yngve, Deputy Chair of the Committee on Environment and Agriculture. The seminar gathered selected participants to discuss the development of environmental zones and diesel cars in light of the development in Germany. Something that was presented by the NGO; Deutsche Umwelthilfe. Participating in the seminar were political representatives, the Swedish trade association for manufacturers and importers of cars, trucks and buses; BIL Sweden as well as the Swedish car owners association; Motormännen. The seminar started with presentations from the speakers and was followed by an open discussion between all participants. Ms. Karlsson-Green made a short presentation of GREAT and then acted as the moderator of the seminar. In March the German Federal Administrative Court in Leipzig said in a ruling not open to appeal that cities can ban all diesel cars that does not comply with Euro 6. The ruling, hailed “a victory for clean air”, is the result of the Deutsche Umwelthilfe suing German cities, arguing that they have a duty to cut excessive air pollution to protect people’s health. Ms. Metz talked about the process leading to “dieselgate” and the DUH’s struggle to enforce EU regulations on air pollution in German cities. The Deutsche Umwelthilfe is not interested in promoting any specific type of drive train, for them the importance lies in public health and following regulations. In light of the defeat devices used to produce good NOx test results the DUH is promoting that car manufacturers should be forced to retrofit hardware on Euro 5 and -6 cars to make them comply with regulations also outside the lab. Mr. Bergman, who has a background as CEO of Chinese/Swedish EV manufacturer NEVS, started by explaining that BIL Sweden gathers all car brands and represents car manufacturers and general agents in Sweden. He talked about their vision for sustainable mobility and transport where cars should be fossil free, accident free and competitive by 2030. In response to Ms. Metz suggestion on retrofitting hardware Mr. Bergman replied that the car manufacturers have not broken any laws and should not be held retroactively responsible.